Renee's Paper Treasures: Sneak Peek Saturday: Stampin' Up! 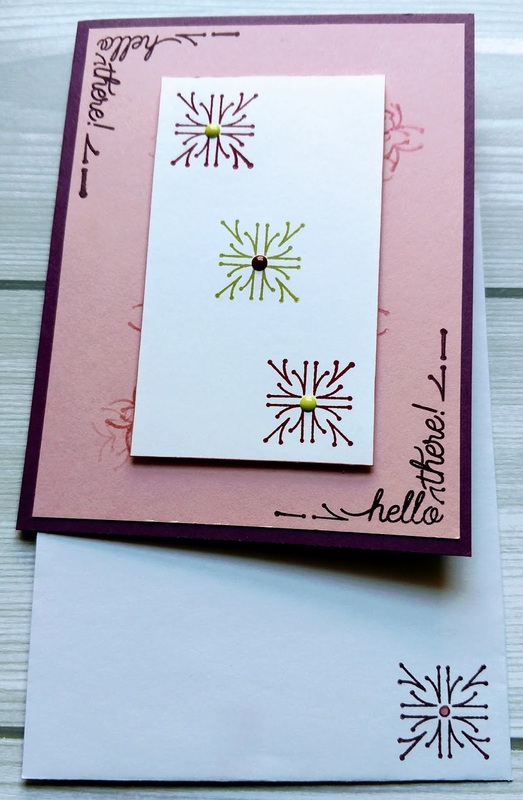 "Around the Corner"
Sneak Peek Saturday: Stampin' Up! 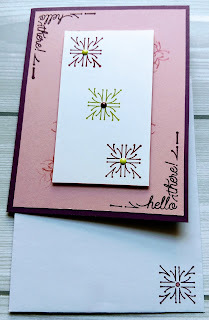 "Around the Corner"
Stampin' Up! "Around the Corner"
Our team's weekly challenge was to create a project using the colors, Fresh Fig, Cherry Cobbler, Blushing Bride, and Pear Pizzazz. I chose to showcase these colors using the "The Around the Corner" stamp set. This stamp is great and the corner sentiment are awesome. This stamp set will be available in June in the new catalog. It was really great using some of the stamp images to make a background. 1. Cut Fresh Fig card-stock 8.5" x 5.5", score @4.25"
2. Cut whisper white card-stock 3" x 3"
3. Cut blushing bride card stock 4' x 5.25"
4. Stamp "Hello there" sentiment on blushing bride card-stock as shown in the picture. 5. Stamp image on whisper white card-stock using cherry cobbler and pear pizazz ink pads. 6. Using the snail adhesive to attach the sentiment layer to the card base. Attach the whisper white layer using dimensionals. 7. Add enamel shapes to top layer. * I chose to use the Regals and Subtles enamel shapes; however, you can use the embellishment of your choice*. Are you interested in a Stampin Up Catalog, well… it’s finally here… the launch of the 2018 Stampin’ Up! Catalog will be June 1st. There are so many amazing products, stamps, accessories, and the catalog is also great inspiration for projects.